Despite being a long-time veg*n and lover of bean curd in many forms, I was never really into marinating it. I’d tried, but it rarely seemed worth the trouble. Until I found this recipe in The Kripalu Cookbook, that is, and my life changed forever. Designed to be served cold, it is indeed delicious out of the fridge on its own or in a salad, but is also wonderful grilled, baked, fried, or just heated in the microwave. Even my self-proclaimed tofu-hating (and non-veg) roommate, who humors me by tasting whatever I cook, surprised us both by going back for seconds the very first time I made it, and, even more shockingly, has since asked me to make it again! 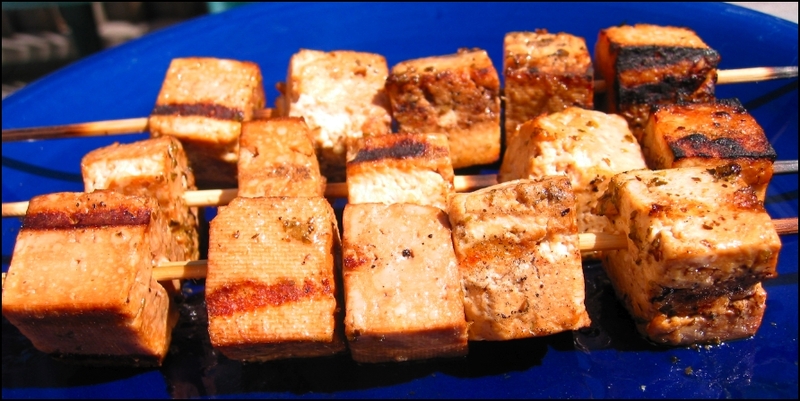 I usually cut the tofu into slices, but cubed it this time to facilitate skewering. It was hands-down the best grilled tofu I’ve ever had. In a small saucepan, combine the remaining ingredients and bring to a boil. Reduce heat to a simmer and cook for 5 minutes. Cut the tofu into cubes or slices are desired and put into a bowl. Cover the tofu with the marinade and marinate overnight. Add to a salad, grill, fry, eat plain, whatever. Or top slices with caramelized onions and bake. (Sometimes I include the caramelized onions with the marinade, too. )Â This stuff is so good baked. That looks like a completely rockin marinade – I have to try it! Another thing that I do is take Drew’s Thai Sesame Lime marinade (at whole foods), dump a bunch over some sliced tofu and bake it for about half an hour at 450. The lime juice helps it soak into the tofu really easily, and I eat it instead of cheese sometimes when I need a quick snack. I made this recipe on Sunday night and what a hit! It was extremely tasty. The marinade smelled great on Saturday when I was heating it up. I served the tofu over Udon noodles along with some broccoli and mushrooms. I reheated the leftover marinade and served it over the tofu and udon. Yum Yum. Thanks! We made this last night for our son and his guests who are vegetarians from India. I did not really expect half of it to be eaten. Instead, there wasn’t enough. Everyone liked it. Thanks!